To be reading this alongside Zuleika Dobson was a fascinating experience; I wonder whether anyone has ever thought to compare them before. They share many themes (romantic attraction, unpredictable women, suicide, metanarrative) and even a tone, saying baroquely funny things in a faux-ponderous manner. But Beerbohm has no serious point beneath his gossamer humor; and Unamuno, the philosopher of Spanish identity, does. 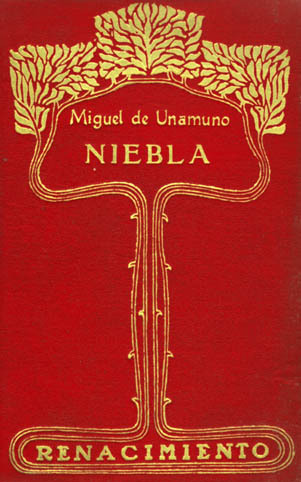 This novel -- or nivola, Unamuno's invented term for a nebulous narrative, more philosophy than plot, and deconstructing the elements of fiction decades before deconstruction occurred to any French academic -- is probably the most celebrated Spanish novel of the 1910s; the only English translation dates from 1928, and is not entirely worthy of it. Although it can be read as an early metafictional novel in the sense popularized by Flann O'Brien, the nouveau roman, and the 1960s prankster postmodernists, Unamuno is really only following the lead of his teachers Cervantes and, to a lesser extent, Kierkegaard. This isn't the place for a close reading of my reasons for disagreeing with the back-cover copy and the academic introduction which calls the most prominent female character "deceitful, scheming," but although Unamuno was no feminist he wasn't the misogynist his political and ethnological conservatism might suggest. The central male character, the one who has all the philosophical discussions and experiences all the novel's Weltschmerz, is never not a figure of fun; the women are (for the most part) sensible, dispassionate, and self-respecting. But this is just a Goodreads blurb. Yeah, five stars. It's great. p.s. Cannot believe I forgot to mention the CLEARLY PARODIC discussion of whether or not women have souls.